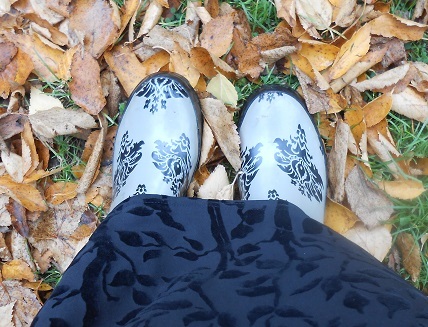 A woodland wedding with wellies! 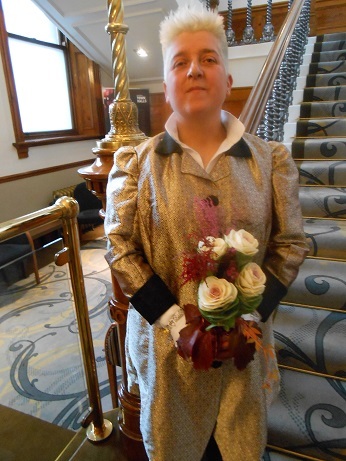 I can finally reveal the wedding outfit that I have been working on for so long as we celebrated my brother’s wedding this weekend. 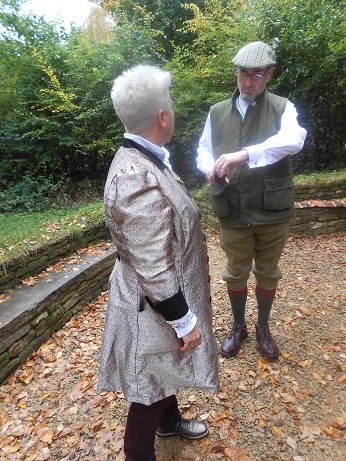 The jacket and shirt were finally finished with three days to go before the wedding! We had a brilliant time, without a doubt one of the loveliest weddings I have ever been to, full of personal touches from Ben and Amanda that made it really special and very memorable. 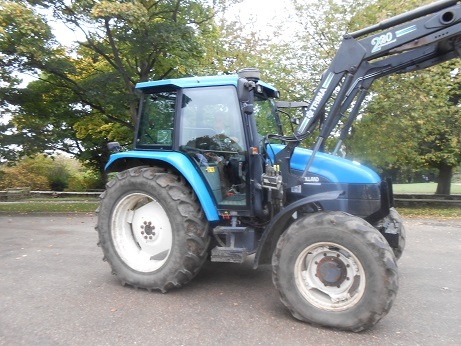 There are not many weddings where the bride gets to drive a tractor as part of the day! 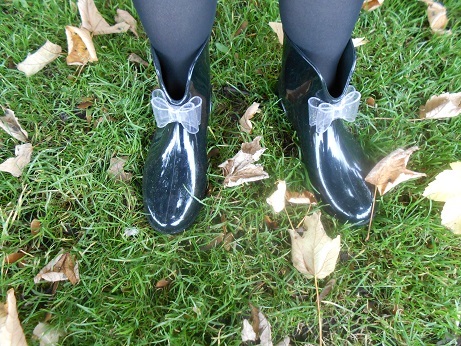 Amanda works at Oakwell Hall, a beautiful Tudor house and country park so most of the wedding took place there. 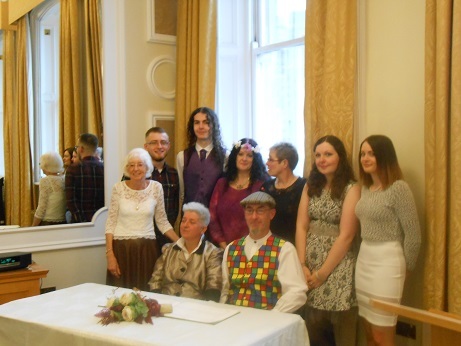 They did have a short legal ceremony at the Registry office, here are all the family with them after signing the register. 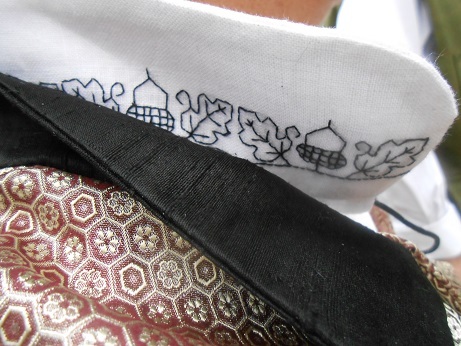 Amanda had chosen a gorgeous silk brocade for me to make the wedding jacket from, with black silk collar and cuffs. 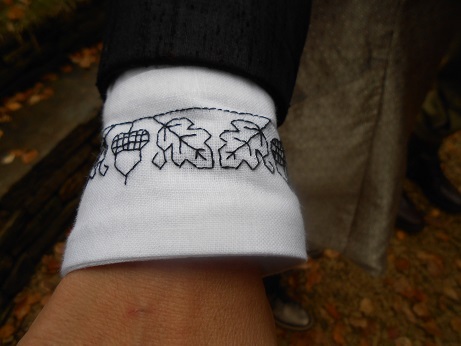 I also made a linen shirt and Amanda’s Mum stitched a blackwork acorn design on the collar and cuffs. 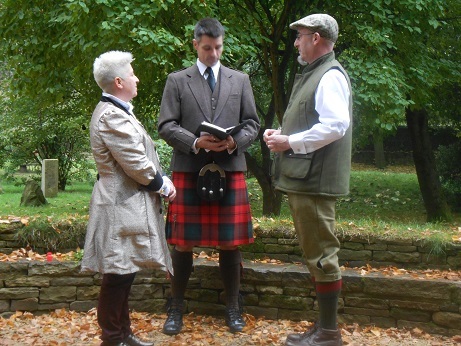 The most important part of the day for them was an exchange of rings in the woodland that is part of the parkland, Amanda helped to build the faith circle where we sat for that ceremony. It was brilliant, starting with Amanda in her tractor leading all of the guests from the hall to the circle where we were all given bubbles to blow as the bride arrived. Here are the kids and their cousins Sam and Sarah enjoying the bubbles. The ceremony featured wooden rings that Ben and Amanda had made themselves and very moving vows where they promised to be each others ‘forever friends’ and go on adventures together. 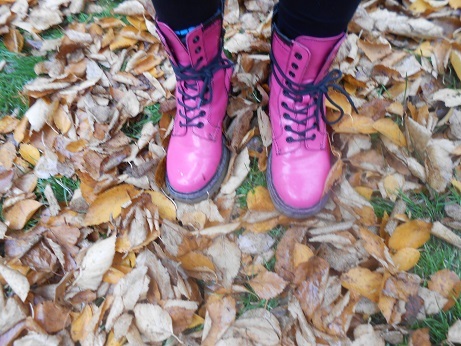 We had all been asked to wear wellies or colourful boots for that part of the ceremony so here are mine, my sister Jackie’s and Ellie’s boots in the leaves. 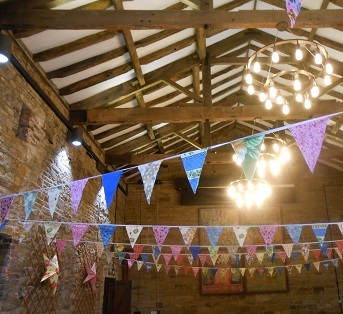 The reception took place in the barn which had been decorated with bunting made by Amanda’s Mum Eileen and sister Kate. 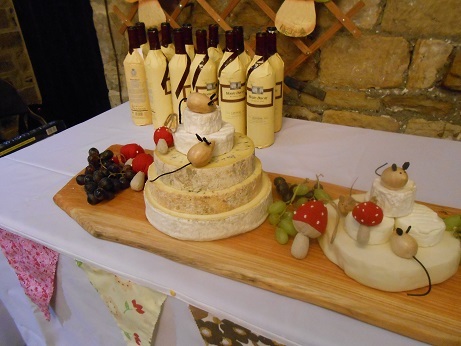 Ben and Amanda love wood-turning and had made all of the serving platters for the cheeses as well as a mushroom for each guest as a wedding favour. 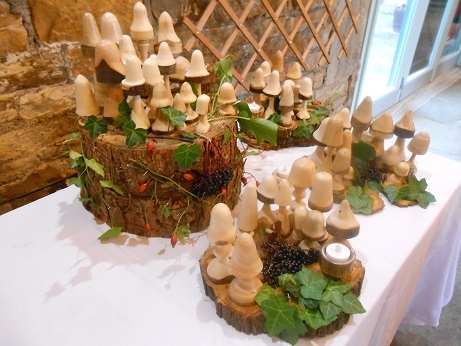 It was Ben’s 50th birthday as well as their wedding and so they had a woodland cake with models of their two cats on and a wedding cheese cake, they also made all of these little mice to decorate the cakes. The evening ended with a fantastic firework display, one of Ben’s favourite things. 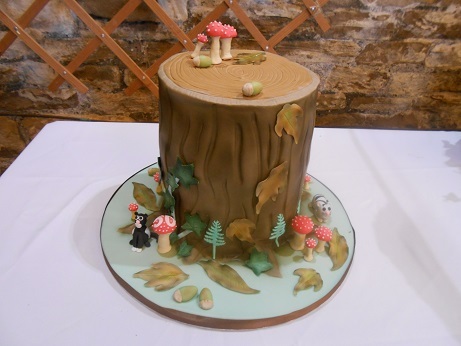 A wonderful day made all the more special by the fact that they did everything themselves, with help from friends and family, from the food to the decorating all of it was very much the way they wanted it to be. 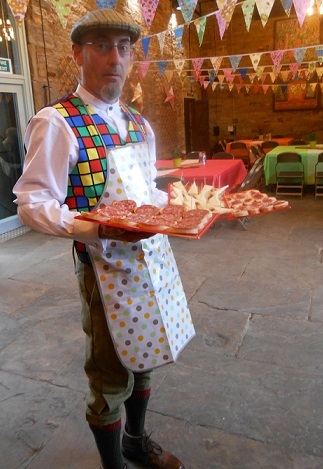 This is one of my favourite pictures from the day, Ben in a very fetching apron serving the canapés! The kids have gone home now so it is all very quiet and I am looking forward to a very relaxing afternoon catching up with some Christmas stitching. Have a happy week ahead, see you soon and thanks for visiting. 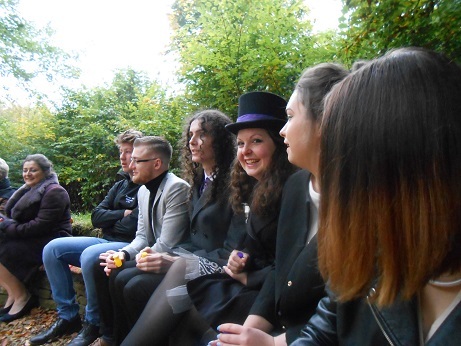 And a wonderful time was had by all! Congratulations to Ben and Amanda!